When raising your vehicle with a floor jack, position the jack correctly. Improper placement may damage your vehicle or cause injury. ●Stop the vehicle on level, firm ground, firmly set the parking brake and shift the shift lever to P (vehicles with an automatic transmission) or R (vehicles with a manual transmission). ●Make sure to set the floor jack properly at the jack point. Raising the vehicle with an improperly positioned floor jack will damage the vehicle and may cause the vehicle to fall off the floor jack. ●Do not jack the vehicle at the suspension. The suspension may be damaged. 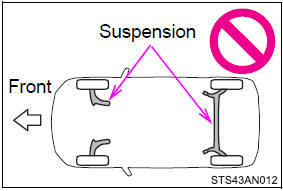 ●When raising the vehicle, do not place any object on top of or underneath the floor jack.